We ate a lot of pierogies when I was growing up, not because I am of Central or Eastern European heritage, or at least not recently enough that we have any record of it. Rather, frozen pierogies from the grocery store were cheap, easy, filling, and tasty, and hence made a good family meal. Last night I boiled up some frozen potato-and-onion pierogies, then I fried them lightly in bacon fat and topped them with freshly chopped bacon bits and fried onion. I served them with (lactose-free) sour cream. When my kids asked what was for dinner and had no idea what a pierogi is, I realized how long it has been since I had made this dinner for the family. I guess I was just trying to keep the food fresh, or at least homemade. Given the warm reception that this dish received and the speed with which the kids gobbled them down, I think I’ll have to make them again sometime soon. However, what I’d really like to do is make them myself, perhaps in a large batch to freeze for future use. Homemade pierogies have always been on my list of things to learn how to make, ever since a friend of mine’s mother served me fresh ones at a sleepover when I was a child. They are so good. I guess I have been intimidated by the way that every family seems to have a secret recipe that they proclaim to be the best, and that only proper grandmothers have the real trick of it. My husband’s maternal grandmother was Polish and promised to teach me all kinds of dishes, but she sadly passed away many years ago, before she could teach me — or my children, who had not yet been born. I think I may just have to find friends with the appropriate heritage and beg them for instruction. We could make a day out of it! And once I have got it down, I could pass it on to my children. 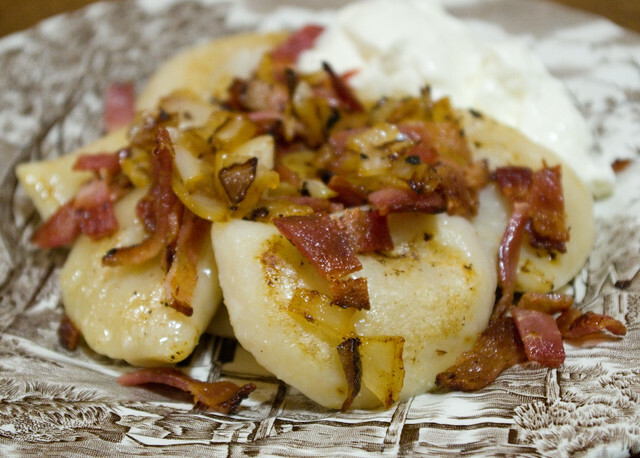 After all, even though pierogies are not technically a part of my heritage, they are definitely a part of theirs, and it’s very important to have connections to your culinary roots.